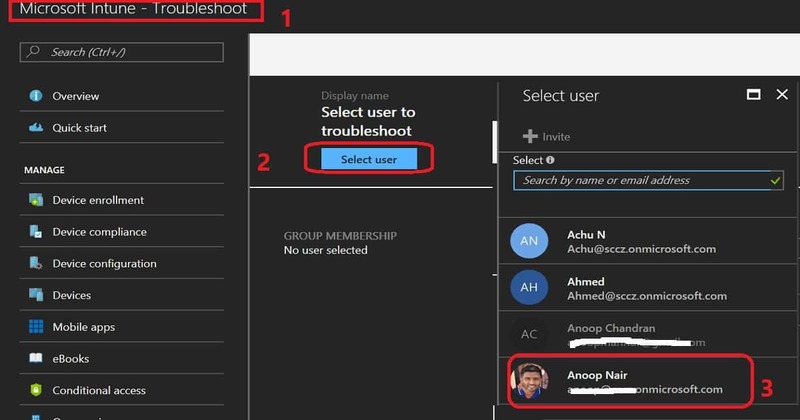 Intune troubleshooting made easy with Azure portal. It’s recommended to start with “Microsoft Intune – Help and support” page in Azure portal whenever you face issue with Intune. In this post, we will see “How to start Troubleshooting Intune Policy Deployment Issues from Intune portal”. More tips “Troubleshoot Intune Issues” in the Video experience here. Update 20-Jan-2018 – When you have iOS device and you want to perform Intune side of troubleshooting then, Microsoft released an excellent document here “Troubleshooting iOS device enrollment problems in Microsoft Intune“. How to Check the status of Intune service? How to start troubleshooting Intune Policy Deployment? 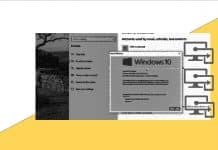 How to raise a free Intune support case for Intune Issues? When you have a major issue with Intune managed devices then, the first place is to look at the current status of the Intune and other dependent services. 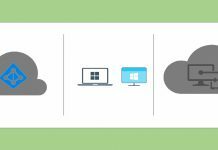 You can check that from the Azure portal Intune blade – Microsoft Intune – Help and support tab. Under Help and Support tab there is a link to check the status of your Intune and other services for your tenant. Intune service status – See the current status of the service is the place where you can get the status. When everything is OK from cloud service side then, the status will show as Microsoft Intune Service is healthy. Also, from help and support tab you can check whether your Intune subscription is still active or not. As explained above, when you have a major impact on all Intune managed devices/users then make sure that the tenant health is OK. Once you are sure that there is no issue from Intune service side for your tenant then, it’s time to proceed with your policy assignment and other detailed troubleshooting. When the issue is NOT impacting all devices or users then, it’s better to start with the second stage of Intune troubleshooting. Troubleshoot is the tab in Intune blade of the Azure portal. 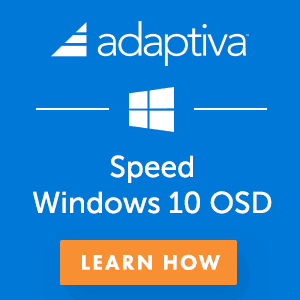 Select one of the users who is having issues with application or policy deployment. For example, when a user is not getting the application assigned to AAD Group. 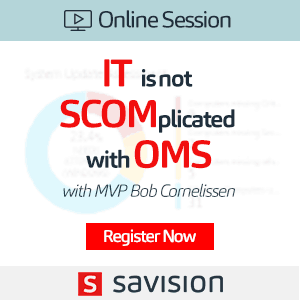 Another example is the user is not getting the compliance of configuration policies assigned. As you can see in the video tutorial here and in the screen shot below, there are some red icons. Those red icons could indicate potential issues with application or policy deployments. I could see problems with Android device of Anoop. App protection status is not looking good for Android device. The Intune troubleshoot blade provides a useful report that “31 apps noncompliant”. There are Six (6) Assignment categories in Intune Troubleshooting blade. Each category will give you the details of user assignment. If some assignments are missing then, we need to look at the targeting AAD groups of those policies. The above information is important to start Intune troubleshooting from Azure portal. We can directly go into details of each of the assigned policies for that user from troubleshooting tab. More detailed troubleshooting can be done via looking at the device properties and hardware information of the device. 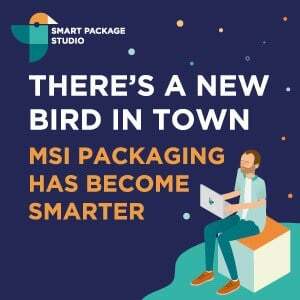 For example, you have started a company data wipe action for a device but, the device or user can still access the corporate mail from the device. 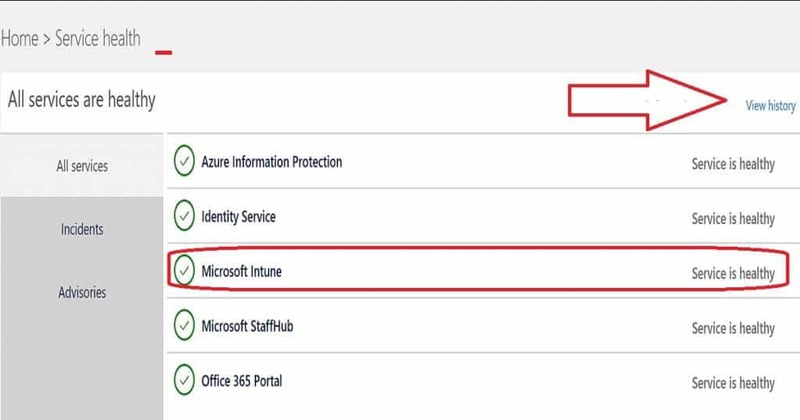 Intune admin can directly search the user from Intune troubleshooting session and get all the device details of that user. Once the device is identified then, you can check the following details of the device. 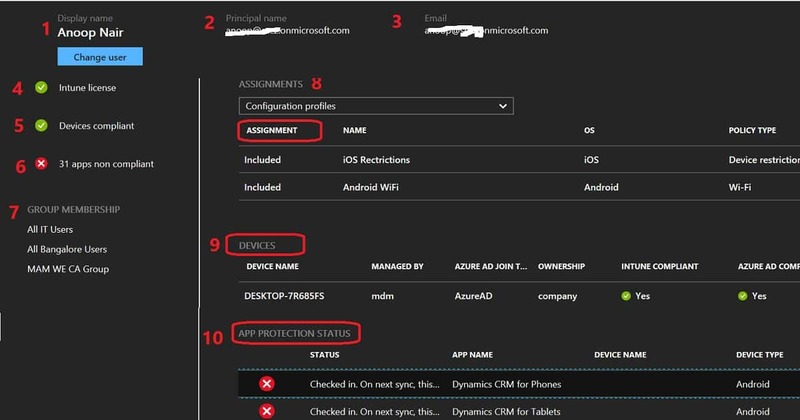 Device name, Managed by, Azure AD join type, Ownership, Intune compliant, Azure AD compliant, OS, OS version and Last check in. Last Check In details are important in this device retirement, or company data wipe troubleshooting scenario. The last check in details will tell you when is the last time the device was in touch with Intune service. 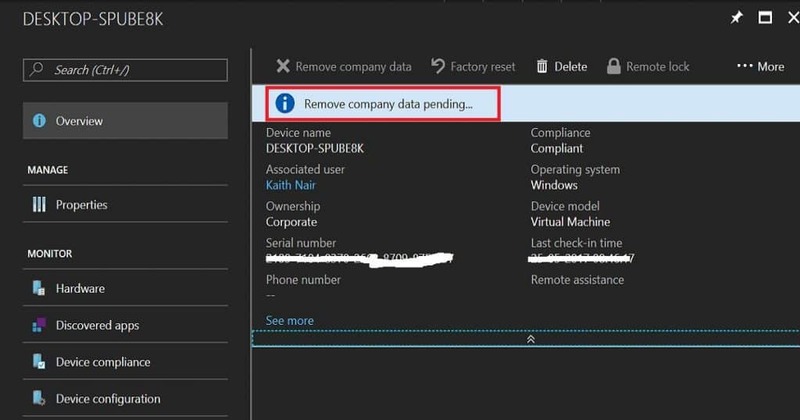 You can check the status of Company Data Removal action, Factory reset details and status from the Intune troubleshooting blade. 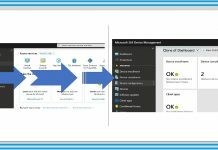 The Intune Troubleshooting blade is one stop shop for all the troubleshooting activities related to Intune device management, compliance policies, configuration profile deployments, etc..
Microsoft provides an option to raise a support case for Intune issues from Azure Portal – Intune blade – Help and Support tab itself. Create a support request link in that tab is for raising a free support case. In most of the scenarios, you won’t get charged for raising this type of Intune support case. The charges of these type support cases are directly linked to your Intune subscription contract. 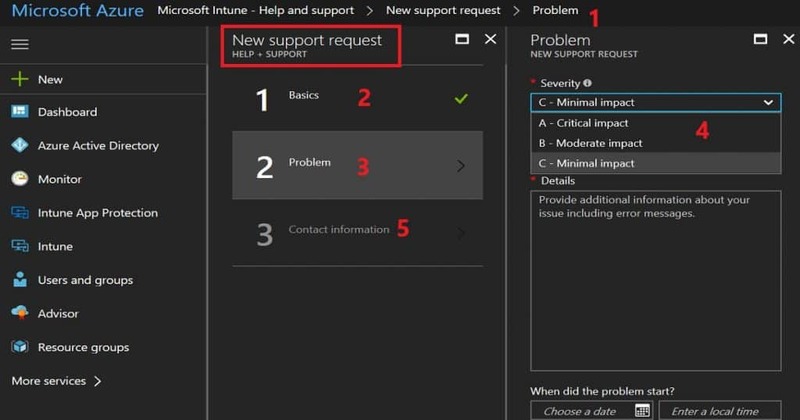 There is an option to raise an Intune support case with Microsoft premier contract. I would recommend using premier contract support for Intune issues which are of high impact and if you need immediate help. 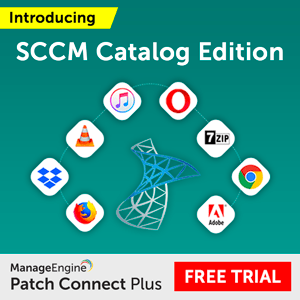 C- Minimal Impact – The issue which is impacting only a couple of users or devices etc. B – Moderate Impact – The issues which can become critical in a couple of days if it didn’t get resolved ASAP. Thanks, that’s very informative and logical:) Cheers!